I finally got through all the broken links on this blog. I fixed most of them, but those which were linked to out of date news articles and websites were removed. There are over 400 redirects, but those seem to be working. I wanted to share a little with you about my first day at the Federation of Genealogical Society’s annual conference. I was so happy to be able to make the short drive to Ft. Wayne and attend this year! I arrived at noon and spent several hours in the library before registration. A day in the Allen County Library is always a good day. I was scheduled for a consultation during the afternoon, so I grabbed by “stuff” and headed of for that. A couple of real good suggestions from a volunteer. I need to work a little harder on my mystery man, who happens to also be my great-grandfather. I attended the FamilySearch Blogger dinner. I guess that was enough to help me realize how much I miss blogging. Great to meet several bloggers I follow, and am friends with, but had never met in person. Among them: Becky Wisemen, Polly Kimmitt, and Julie Cahill Tarr. I even got a glimpse of The Ancestry Insider! At the FamilySearch Blogger dinner, I also got my very first Blogger Beads! Thanks to Thomas for sending them, and to the lady who handed them out. Diane C. Loosle, the new director spoke about some changes at the Family History Library. The concept being rolled out is about collaborative areas in the library where staff and researchers share experiences and research. The library is bringing the staff out from behind the desk and setting up areas with film readers, computers and tables where researchers and staff collaborate during research. According to Loosle, a trial area for Nordic research on B1 has been very successful. The other concept presented in detail was the, “Family History Discovery Center”. Three to five of these Centers will open worldwide during the next twelve months. These will have the traditional research equipment, film readers, computers and so on, but also offer multimedia experience and other resources. These services appear to be outreach to younger and those less likely to have experienced traditional research. The concept that most interested me was the “Oral History Recording Studio” concept which will be a part of the discovery centers. For an eight dollar fee, you may interview a relative or other person of interest and take away a one-hour high definition video of the interview. I wish I had one of my grandmother, or even mother! The general focus of most of the new FamilySearch initiatives becomes evident in their expression “Not Charts, but Hearts”. Watch for a lot more on that general concept. Some researchers wonder about underemphasis of actual research techniques; it will be interesting to see if this approach draws more people into serious research. Thank you FamilySearch for the great meal, and for spilling the beans on your direction. William was my grandfather. I originally posted this short biography on my old website, more than ten years ago. I am finally getting around to adding it here. 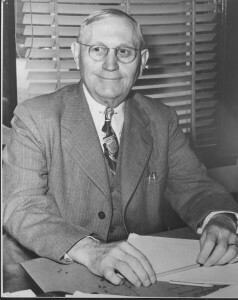 William Henry Yearnd was born ca 1883 in Howell Michigan. 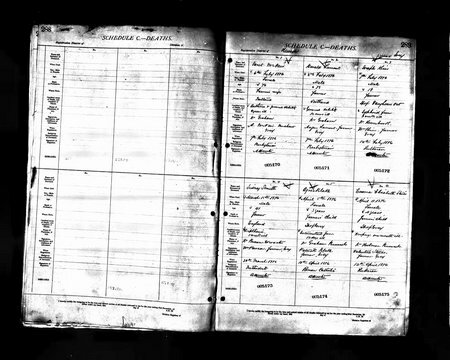 I have found no birth or baptism record. His birth and parentage is supported by other several records. 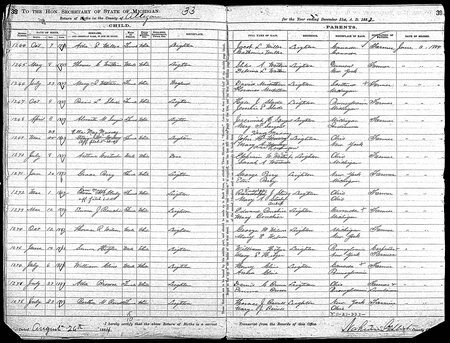 The first, his marriage record, # 54 of the year 1908 in Wexford County, Michigan recorded 9 April 1908, and stating he married Winnie Kaiser, daughter Wm Kaiser and Jane Johnston on 8 April 1908, and listing his parents as Chas Yearnd and Lena Detman. 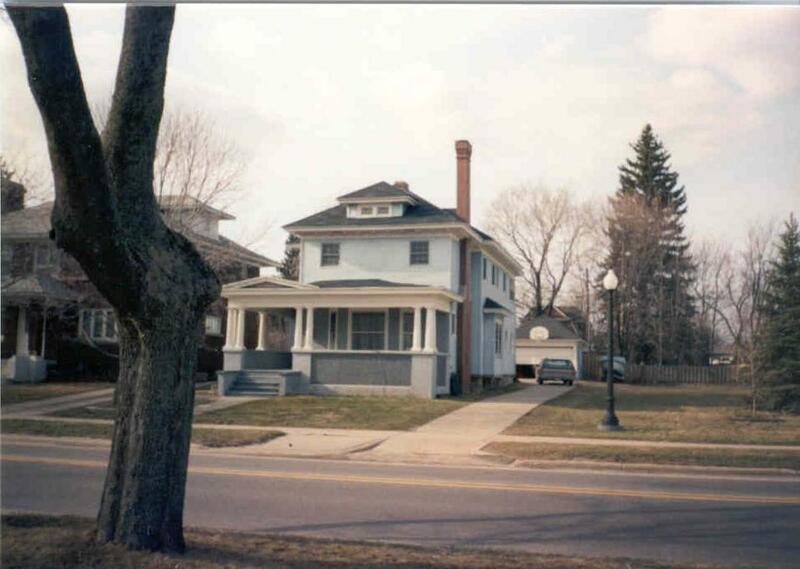 Upon the death of Charles Yearnd (sometimes Yournd) of Howell, MI on 20 July 1911, there was no will, however William Yearnd appears on the determination of heirs for the estate. The heirs are listed as: Lena Yearnd, widow; Fred Yearnd, son; Augusta Yearnd; daughter, Frank Yearnd, son; William Yearnd, son. William Yearnd was the attorney who filed the case in probate court. A clipping of an obituary for William, which is not identified as to date or paper it is from, states he was born in Howell, Michigan on 28 June 1883, the son of Mr. and Mrs. Charles Yearnd. William, of Cadillac is listed as a survivor in the obituary of Charles Yournd. Several biographies and articles were printed in newspapers between 1908 and 1948 which note that William Yearnd was born in Howell, MI. William’s wife, Winnie, kept a scrapbook which preserved many articles, but does not always identify the paper or the date. The public cannot access the archives of the local paper in Cadillac, and there is no microfilm. Howell, Michigan is located in Southeastern Lower Michigan, northwest of Detroit. It was a small town, typical of many in the Midwest. There was, for a time a condensed milk factory, which provided employment. The majority of the residents were farm families or laborers. 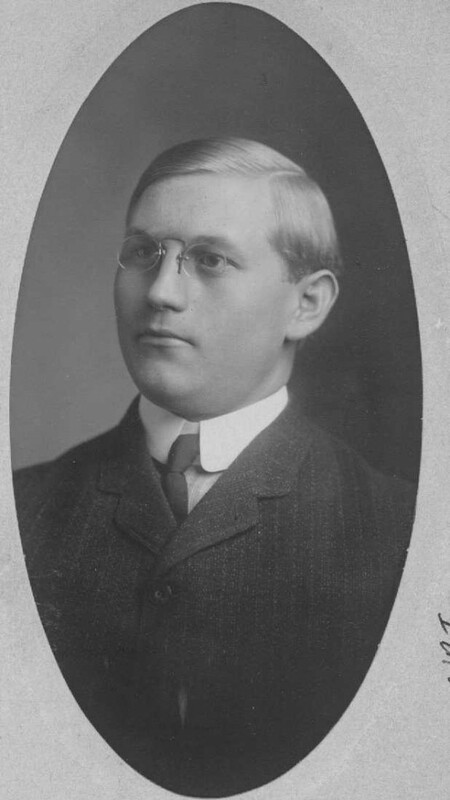 William Yearnd attended the University of Michigan. On particular article stated that he shoveled coal to put himself through school. According to the University, they maintain some files of graduates in the Bentley Library, and William Yearnd is among those with a file. I will post what I find when I am able to look at the file. William received an LLB in 1905, and upon the recommendation, and with references from of a school counselor joined a law firm in Cadillac, MI. 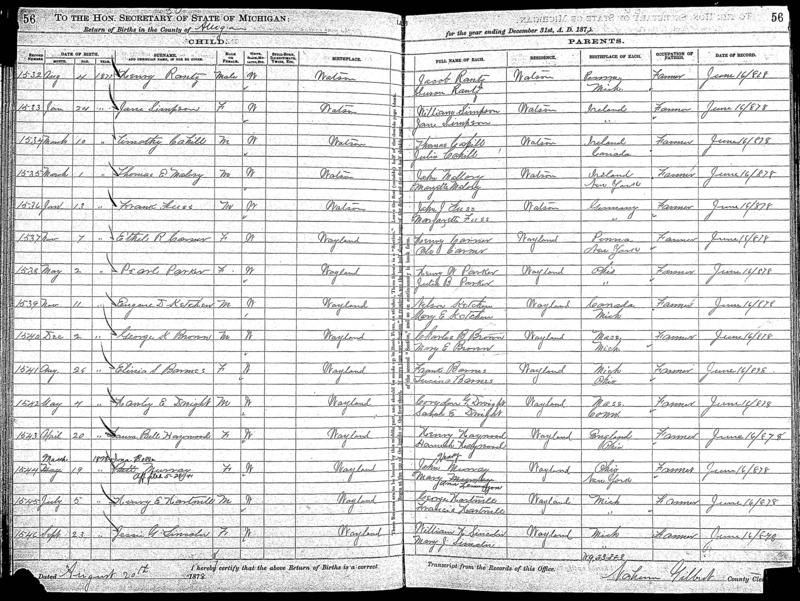 On 8 April, 1908, as previously noted, he married Winnie Alice Kaiser, a local girl who was employed as a clerk in the Wexford County Court House. It is natural that they should meet, since a local lawyer would frequent that place. In the minutes of the Clam Lake Township board of November 30, 1910 it is noted that Fred Wetmore and William Yearnd were appointed to defend the Township in a recently filed lawsuit. There were 5 children in the Yearnd Family, Margaret Jane born in 1910, Marion Augusta born in 1912, Helen Elizabeth, born in 1914, William Henry born in 1917, and James Austin, born in 1927. Although no one knows, it appears that the children were named for relatives. Margaret and Jane were Winnie’s Aunt and Mother respectively, Augusta was the name of William Yearnd’s sister, Elizabeth was the name of Winnie’s paternal grandmother, Elizabeth Long Kaiser, William Henry was obviously named for his father. My father, James Austin, was likely was named for two uncles of Winnie, James Johnston her Mother’s brother; and Austin Kaiser, her Father’s brother. The family home was at 703 E. Division Street in Cadillac. The house is a short 2 block walk to the courthouse and William walked to work there often, according to local accounts. The Yearnd Family were members of the First Congregational Church in Cadillac. That church is an active congregation today. 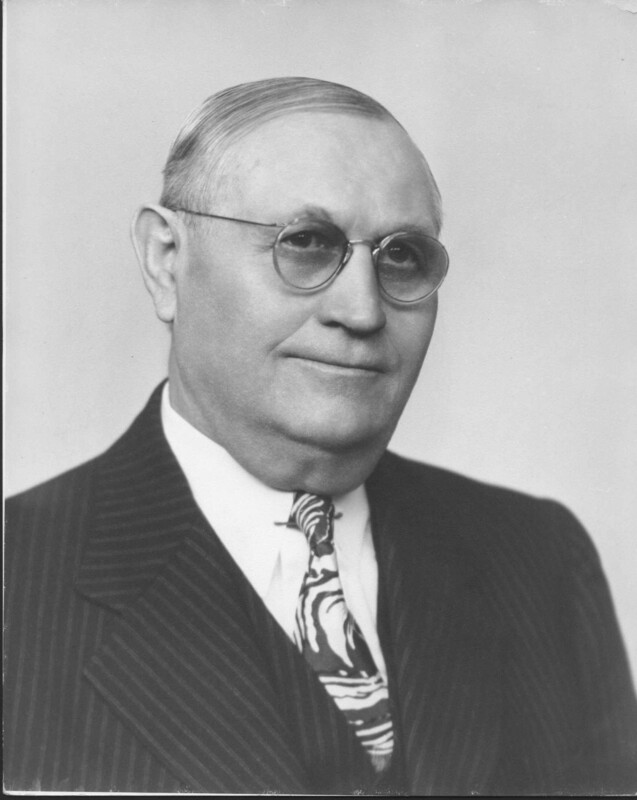 In August 1918 William Yearnd was appointed the City Attorney of Cadillac. He resigned that position in 1939, stating a need to spend more time on his law practice. He was also Wexford County Prosecutor for twenty years. William Yearnd was appointed Probate Judge for Wexford County, taking office January 1, 1923. William Yearnd is listed under the heading “Lawyers” in the 1930 Polk City Directory of Cadillac, Michigan. 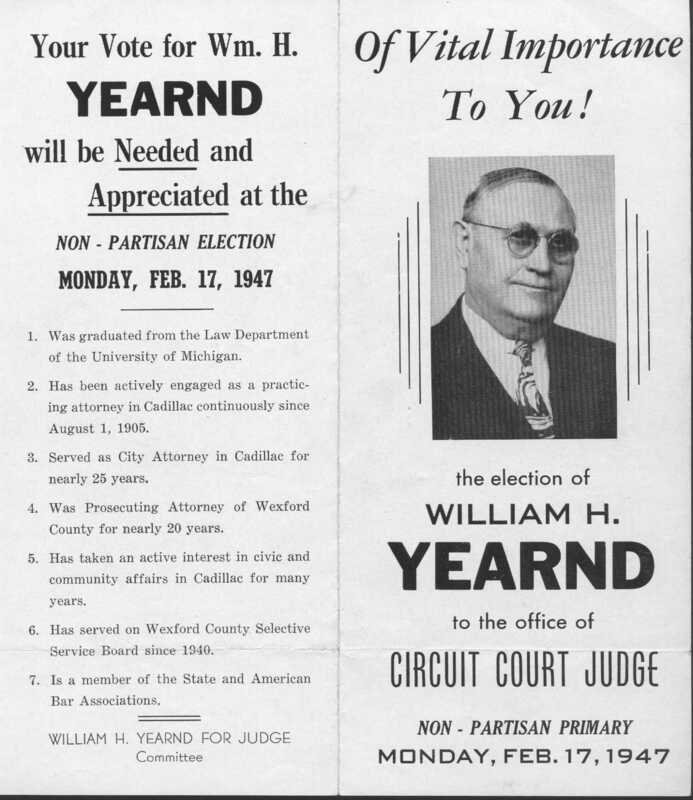 William was elected circuit judge in 1947, the campaign brochure which I found in my grandmother’s scrapbook speaks volumes about the difference in politics then and now. You can read the brochure front and back, and the brochure inside. William Yearnd was a golfer, he had 3 holes in one to his credit. A undated clipping shows describes his accomplishments. He played golf at the Cadillac County Club. I am down to 575 items to enter into my database. I have not worked on that task much since I last reported in. I did make a trip up to my hometown of Cadillac, Michigan, and looked through a large collection of yearbooks that the high school librarian there has archived. The earliest one was 1918, and I wished they had started just a little earlier. I did enjoy them, and they helped me sort out which family pictures were from which year in high school. I have been side-tracked working on a genealogy society project. We are also sliding down hill to my husband’s retirement. I recently wrote about affidavits files to correct or change information on the birth records of Eliza J. Murray, and Ina Belle Murray, her sister. The Lamunion bible transcription also listed Etta Murray born March 29, 1883 died July 20, 1964. 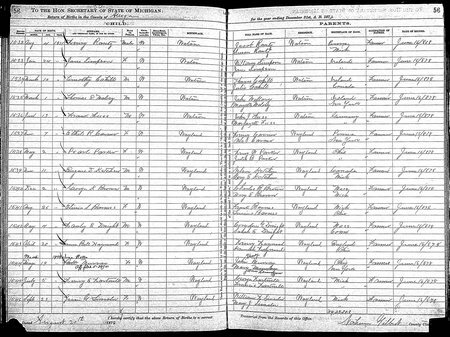 Etta was the last child listed for this family, and was born after the 1880 census. Two children were born between Ina and Etta. Arthur was born 29 June 1879 and died 8 November 1879, and George was born 16 June 1881 and died 21 August 1881. 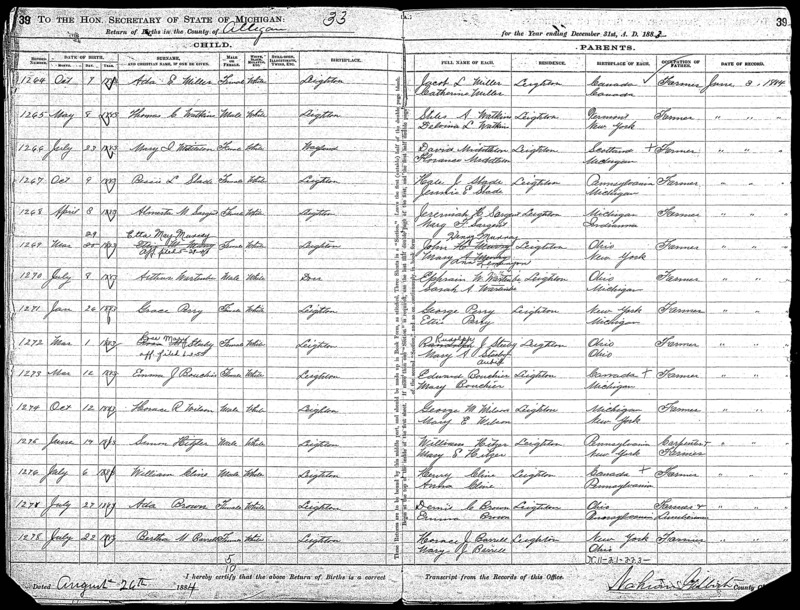 Etta’s birth record, #1269, recorded on Page 39 of the birth returns of Allegan County, Michigan has a correction, too! The date is changed from March 30, 1883 to March 29, 1883, and her name is changed from Etta M. To Etta May. Her parent’s name’s are also corrected, the H in her father’s name changed to Henry, his last name changed from Murry to Murray, and her mother’s name changed from Mary A Murry to Mary Ann Lemunyon. Etta filed for the correction on the same day as her sister Ina’s, “5-29-1941”. I really don’t have any conclusions about this. It does make me wish I had known the three sisters, who were obviously interested in having these records mirror the bible record. I left off with the saga of Eliza J. Murray’s name, or names as the case may be. In earlier days before a birth certificate or some other legal ID was required for everything, there are many cases of names being changed, or people using a different variation of their name on every record we find. I have found several cases of men who have reversed the order of their middle and first names on different records. As I moved on in the Murray family, the next document I had to enter was the birth record for Ina Belle Murray, shown below (click to enlarge). Surprise, surprise. 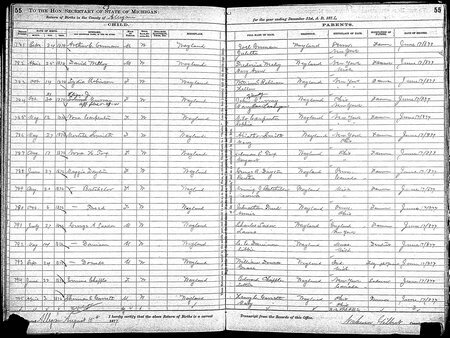 She was listed as Belle I. on the 1880 census, and she also filed an affidavit to change her name, on 29 May 1941. Bell is crossed off on the record, and “Ina Belle” written in. John Murray’s name has a middle name of Henry added in, and Mary’s maiden name is added below a crossed off Murray. 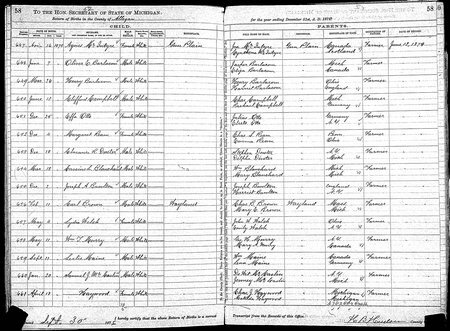 The Lamunion Bible transcription lists “Innia Bell Murray”, born March 19, 1875. The biggest surprise here is that “Wm T Murray’s” father is listed as Geo. 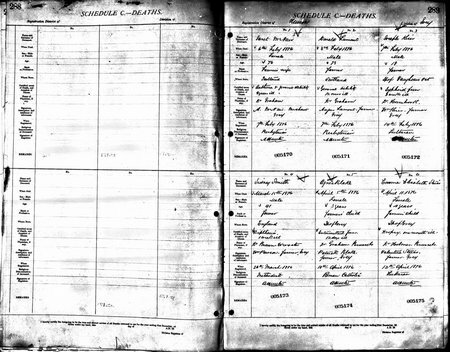 H. The fact is, I would have never found this birth record if I had searched using “William”. I found it my searching for “Murray” in the father’s name, and using the year, 1875. There’s more to learn, stay tuned. One victory at a time, I am down to 690 items to enter into my genealogy database. When I started cleaning up and entering, the number stood at 1419. Moving right along, I hope to finish in 2 weeks or so. Maybe, if I don’t get side tracked looking for more records. I’ve been entering data into my genealogy program. These are files which I had collected in a folder on my computer. I started with 1419 on January 19th, and worked my way down to 1440 1140 on January 23rd. Today I am happy to report that I have 837 items left to deal with. To be absolutely fair, I have found that some of the data had been dealt with, kind of. That means that perhaps an obituary was transcribed, but the reference wasn’t entered, or the files weren’t linked. And, some of these files were simply gravestone photos to be linked, not a heavy-duty job. But, others were wills to transcribe, and I am holding off on a group that will take some heavy duty transcription. Anyway, it does look good to see my tally list down to 837, meaning I have completed 582. Murry, John, white, male, 33, head, married, farmer, unemployed 3 months, born Ohio, father born Ireland, mother born Germany. Mary A., white, female, wife, married, keeping house, born New York, both parents born New York. La Munyan, Rescum, 73, father-in-law, widower, farmer, born New York, both parents born Rhode Island. Murry, Wm H., 5, son, single, born Michigan, both parents born New York. Louisa J., 3, daughter, single, born Michigan, both parents born New York. Belle I., 2, daughter, single, born Michigan, both parents born New York. Later, John and Mary Ann had three more children. 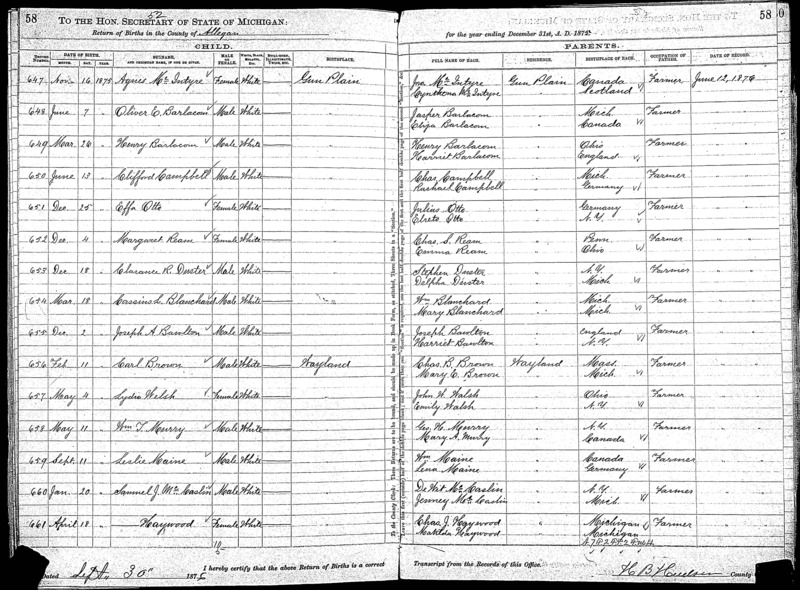 From the Michigan birth returns at familysearch.org, returns of births in the county of Allegan for 1876, page 55, #784. The record has been corrected by an affidavit filed on 29 May 1944. The name changed from Louisa to Eliza J, the date of birth changed from October 30 to October 31, and John Murray’s name has “Henry” added. I went scrambling back for the bible transcription. the transcription was done by two descendents of another Lamunion line, in 1975. At that time the bible was in the possession of Hulda Aurilla Carter Terwilliger of Grand Rapids, Kent County, Michigan. Mrs. Terwilliger (1897-1977) was a granddaughter of Rescum through his daughter Emily, who married Andrew Jackson Carter. It said, “Eliza J. Murray, born Oct 31nd 1876.” Eliza can be a nickname for Louisa, or Elizabeth, or a name on it’s own. This is the death registration for Joseph Kaiser [Grey, Huron, Ontario]. I guess picky, fussy, or whatever, but I don’t like the look. I open these in Photoshop and make a few adjustments, then I attach the result to my database. It is not any easer to read, but if removes what I hate, the tip, and the black edges. If you use photo editing software to do this type of thing, be sure you don’t crop off important information, like the page number. Grey, Huron, Ontario Deaths, 1876, p289. Joseph Kiser, died on 7 Febry 1876, male, 18, farmer, born Tp of Vaughan, Ont; cause: Typhoid fever, 2? 3? weeks ill, physician: Dr. Homebrook, informant: Wm Kiser farmer of Grey, registered 14th Feby 1876, religion Lutheran, registrar illegible, # 005172. I am happy to report that I have entered data from 279 of my collected files, meaning that I have 1140 left to do. I have entered data 12 separate sittings in the 5 days since I posted about the problem. The most interesting thing I have entered is a transcription from pages of my grandmother’s family bible. I do not have the bible, but a cousin was kind enough to scan the pages and send them to me. It is partly written in German, and partly in English. After I consulted with a friend who can read the German part, I realized that the English was mainly a translation of the German writing, probably done for me, or people like me that can’t read the German. 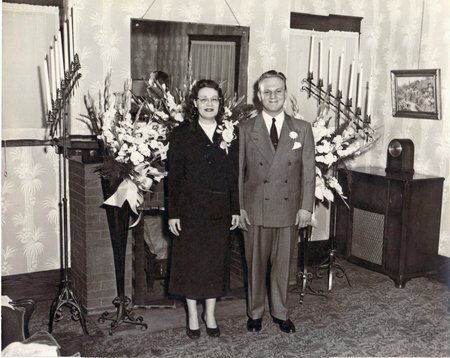 About ten years ago, I threw a tent in my car trunk and headed off to Canada to find out more about my Kaiser and Johnston families that resided in Huron County. It was not that simple, I did a little investigation in advance. What kind of investigation? I took every photo out of my grandmother’ photo album and wrote down the city and photographer. The photographers names didn’t help me as much as I had hoped, but putting marks on a map on all the cities told me that I needed to go to Huron County. I didn’t know that before I looked at the photos closely. Sadly, I was able to find death registrations for all three when I returned to the library. Now, William and Elizabeth had 10 children. When I received the pages to the bible, I had another surprise, the page clearly listed Maud, born 28 April 1877 and died 28 August 1877. Hmmm. If you have ever looked at the Ontario vital records, either on film or on Ancestry.com, you know the records are scrambled and hard to find. I finally found Maud’s birth, registration # 11196 / No. 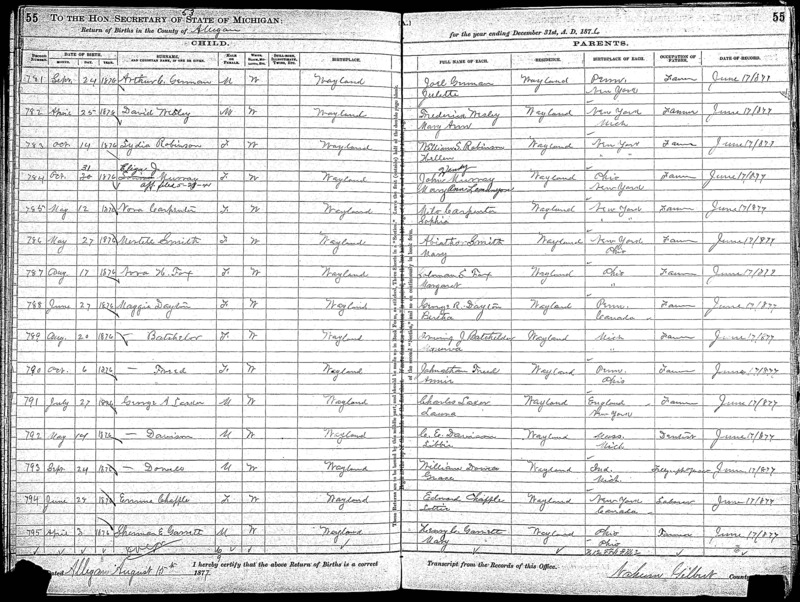 39, born 1 May 1877 Maude, female, father Wm Keser, farmer, Grey, mother Elizabeth Long, name of accoucheur: none, recorded 4th June 1877, signature of registrar: illegible. I have not been able to find a death registration for Maud/Maude yet, and I have not found her burial place. I see a large gap between Joseph and Mary Ann, and another between Elizabeth and Cecelia. I believe that Joseph, Mary Ann, William and Elizabeth may have been born in Vaughan township, York County before the Kaisers moved west to Huron County. More investigation is required to determine if I have really found all the children. First, I am working to whittle down the unentered data. My parents, James Austin Yearnd and Marjorie Helen Herrington, were married on this day in 1951. The wedding was held at my grandmother’s home, 703 E. Division, Cadillac, Michigan. The picture hanging in the wall on the right is hanging in my house today. It is an English water color, about 15 x 28 inches, by Henry J. Sylvester Stannard. It still has the label from a New York gallery; the title of the painting from the label is, “Home From Market” near Flitwick, Bedfordshire. I also remember the clock which is sitting on the table under the painting. I believe Dad told me it was a “Kaiser” clock, but I don’t know which member of my Kaiser family it may have belonged to. Kaiser was my Grandmother’s maiden name. I do not remember the wallpaper in the picture, but the carpet is very familiar. It was a flat wool rug with no padding, in a maroon color. If you click on the picture to enlarge it, on the left under the window, you will see a pull string from the window shade. Every pull in my grandmother’s house had string crocheted on it, just like that one. It is a detail I had forgotten until I looked carefully at the picture. My parents divorced in 1964, after three children. Perhaps I shouldn’t be remembering their anniversary, but without the marriage, I would not be here. I’ve spent the last couple of years immersed in my genealogy society, trying to assist in a number of ways. I woke up one morning in December and realized that I had not worked on my own projects for some time. Well, that’s not exactly true, I have continued to collect information, but I haven’t entered it into my database. I have a mammoth file folder in my computer containing unentered data. The great majority are photos, census pages and obituaries. However, there are also birth, death and marriage records, news articles, graduation announcements, funeral cards and a huge variety of other crap items that I have collected. I started earlier this week, and right now I am down to 1419 items in the file folder. Holy cow, I wonder when I will get done wading through this mess? In addition to that, I have a file folder of items that have not been scaned yet, and the accompanying notes. I think I will be leaving the scanned items for the end of the project, but depending on progress, I may have to move some of it up. One problem I am having is that when I open up a record for a person, I find that some of the citations are not up to my current standards. After looking carefully at the calendar, I have decided to fix the “truly horrible”, but leave the others. How am I judging this? If I could find the source for the information by reading the citation, it stands, perfect or imperfect. If I cannot tell what in the world I was thinking, I am looking up the information again, or putting it on a list until I have a good source. I am going on a trip to Salt Lake City in April, and I want to have some semblance of order before I leave. After all, how do I know what to look for if I do not know what I know? Really. In order to reach my goal, I have been looking at each file, one by one. If it is a family I think I want to search in SLC, I am entering the data. If not, I have made a file folder within the “unentered data” folder with the family name and I file the item there for now. I am hoping to have a good handle on my families before April, wish me luck? Has anyone else out there let information pile up like this? How are you dealing with it?